Larian have the most beautifully predictable development cycle. They release a game, it’s huge but a bit shaky around the edges, and one year-ish later they release a final edition that’s got a huge pile of fixes and extras. At this point you wonder why anybody even bothers with the first version, but then again, I suppose they only find out what needs fixed or boosted after millions of players have hacked at it for a bit. 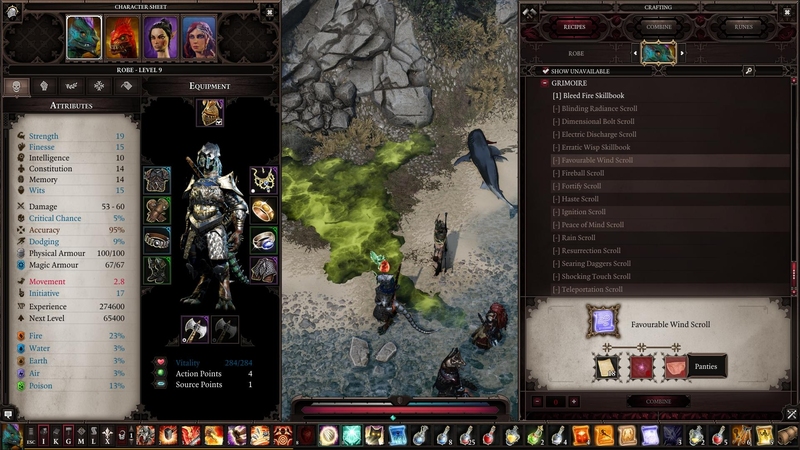 So here we are again, with Divinity: Original Sin 2: Definitive Edition. Point one: it is kind of actually a sequel to Divinity II rather than Original Sin (which was a prequel to everything). Point two: why isn’t it called the Divinityve Edition? The best narratives are the ones that lean on their settings, where the mythology and the politics of a land are an important element of the story rather than mere set dressing. 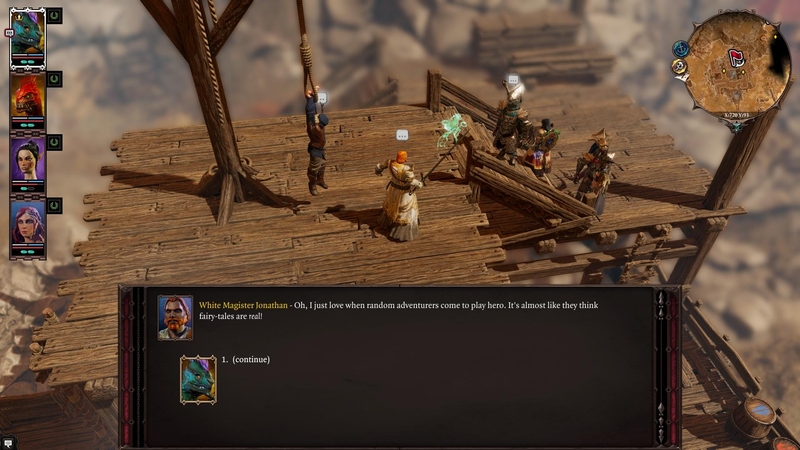 Divinty: Original Sin 2 has this in spades. The Seven gods are important, the magic powers you wield are important, and there are twists and turns abounding as they unwind how all these things fit together. My memory of the original Divinity is a little hazy at this point so there might be more than a touch of the retcon flying around, but overall it’s a fascinating extrapolation of all the madness that has come before. 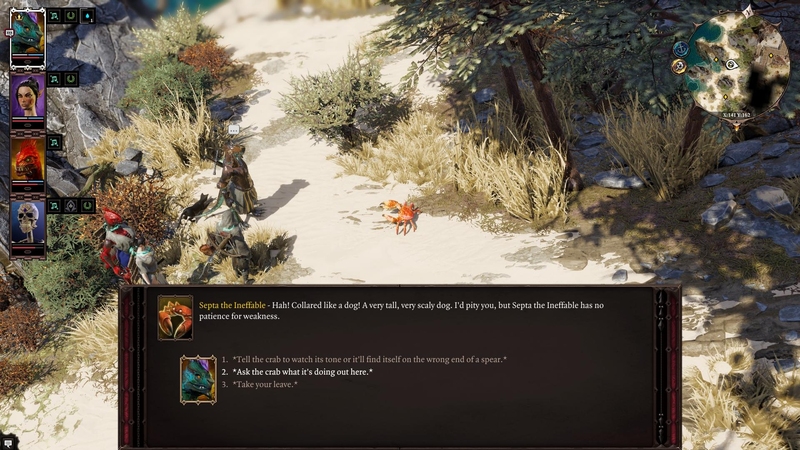 I can’t imagine anyone playing the game without the Pet Pal perk, which lets you talk to animals, because the animals tend to have the best banter. However, while the main plotline of D:OS2 is excellent and full of interesting twists and turns, it does seem to get lost in the minutiae of everything else. The game unfortunately has the same structural flaws as its predecessor that makes working through the it a choppy affair. 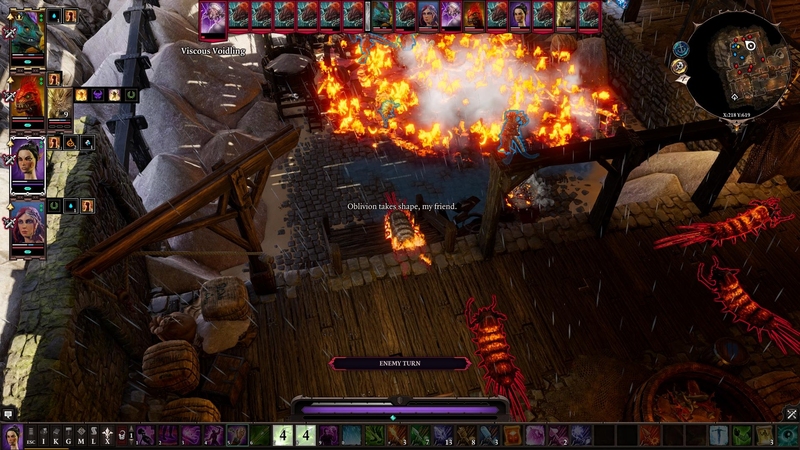 Divinity: Original Sin was a confused game in that it acted like an open-world game, where you could choose to “go anywhere” and “do anything” in “any order”, but it was functionally a linear game. Although landscapes opened wide for you, the combat encounters awaiting you were arranged along a golden path — one that was obscured to the player but rewarded you with impossible fights if you strayed off it. 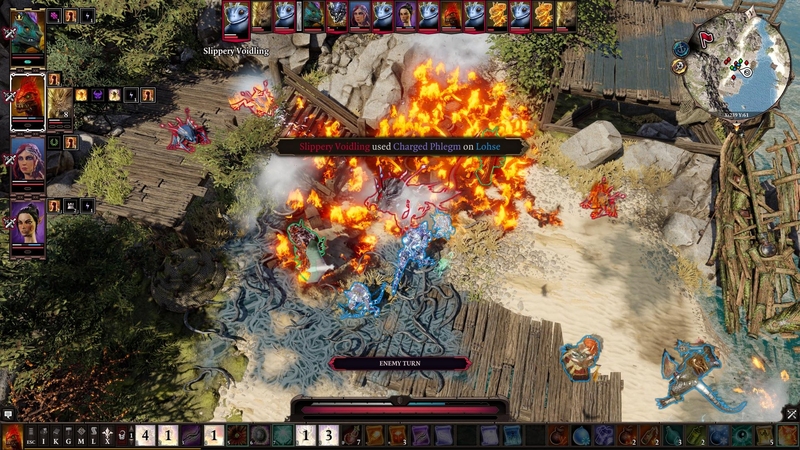 This is most keenly felt again in the second act of Original Sin 2, the town of Driftwood and its surrounding environs. It’s a huge area, huge and dense, with quests sparking off in all directions — perhaps too many directions. Problems arise when you want to follow a particular quest but run up against an encounter beyond your pay grade and have to divert to another; and then you find that other line is also too high for you. I love how the evil bugs are still incredibly well-spoken in their taunts. The thing about Driftwood is that over its course you go from about level 6 to 16. That’s a huge mechanical gulf, and as you get to the upper reaches of that range it takes even longer to get enough experience to trip over the next line. That means if you’re level 14 and see some level 16 enemies, you might be another four hours or more of gameplay away from being reasonably able to tackle them. Soon you’ve forgotten who was doing what to whom because it’s so difficult to keep following a single thread. I think they would have been well to split this second act in half, which would ensure the open world exploration was more constrained, such that seeing somebody slightly too tough would be a source of excitement to be anticipated Soon rather than something to be forgotten about for a week. Spells are at least satisfying to cast, because even if the enemies don’t go on fire this turn, the surrounding environment sure does. Combat has also had a tune-up that I’m in two minds about. Traditionally enemies have a single hit point bar to whittle down, but this time there are two additional armour bars added into the mix — one that resists only physical attacks, and one that resists only magical attacks. In theory, this is an interesting system. It means you need to choose where to send your party members to make most efficient use of their skills. Warriors go up against enemies with light physical armour, where their basic sword strikes can ignore the magical resistances and get to the underlying vitality, while the mages unload on the heavily physically armoured foes who have weaker spell resistances. It means you can’t just whale on a single enemy at a time, but need to shuffle around a lot more. It is, of course, not shy of deploying the meta-humour. In practice, though, there’s a spanner in the works, because while a character has a shred of either physical or magical armour, they will shrug off the status effects that come with your special attacks. Physical armour stops enemies from things like being knocked down, magical armour stops them from going on fire or acquiring any number of handy status effects. 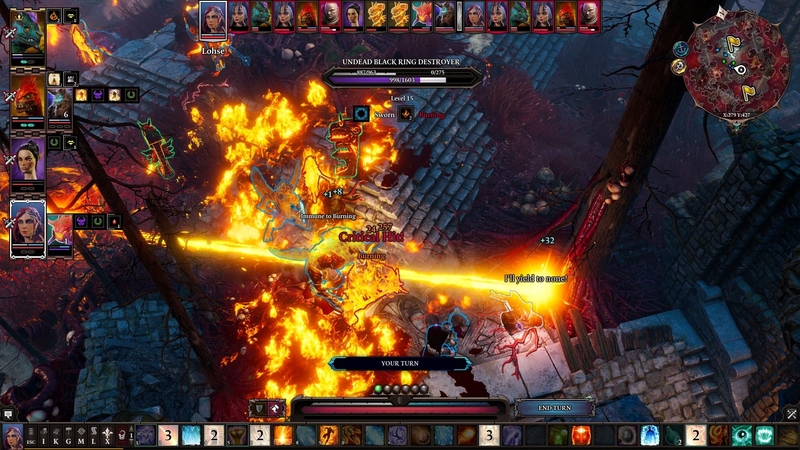 Since every encounter starts with everyone at maximum in all meters, it means there’s a strangely dead period for the first few turns where it’s almost pointless to use any special skills — because while they will do damage as normal, the special effects that allow you to control a fight rather than just participate in it won’t take hold. You can make it rain and then electrocute the puddles all you want, but nobody will get stunned until you’re half-way through the encounter. Your best bet is to concentrate on damage until you’ve flensed those armour meters away, at which point the raw vitality bars seem awfully small and it’s all over. Hehehehe, favourable wind. Although there is a recipe centre to help you repeat good crafting combinations, there are still thousands of items and you’ll never find every combination (nor, to be fair, particularly need to). Needless to say, there are ways to replenish physical and magical armour during combat, once again disabling those special status effects and thereby drawing out fights into long, hard slogs. Which is especially irksome when you’re on the cusp of the fight being a bit too difficult, and it’s more than half-way through before you realise just how out-classed you are right now. Even worse, when enemies cast spells their status effects seem to ignore your team’s armour more often than not. So while you can’t get a foothold on them, they tend to be able to lock you down much sooner, fostering feelings of frustration and unfairness rather than meaty challenge. I always feel bad when the enemies are cute. How bad could these froggies really be? Oh, they want to destroy the world. So it is a bit of a mixed bag. 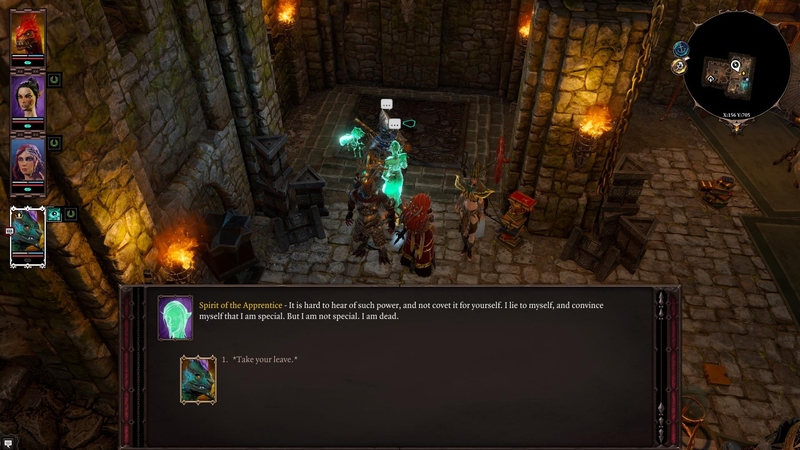 You can rely on Larian to produce fantastic writing, swinging between delightful whimsy and po-faced heroism and everything in between; of that, there is no doubt. But the pacing spoils it and the triple-layered health meters sound good on paper but in my experience they only served to draw out fights rather than to make them more interesting.